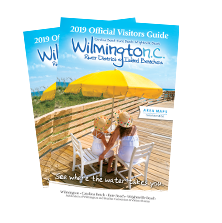 Wilmington and its island beaches is a favorite coastal playground that brings visitors from around the world to its shores. But here’s a secret about Wilmington – it also has beautiful public gardens. Since I love flora and fauna, one year I took a trip to see these gardens. Wow, was I surprised. I like unusual plants so it was easy to pick my first stop – Carolina Beach State Park and its collection of Venus flytraps. 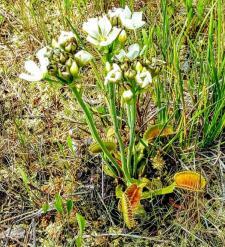 You won’t find these carnivorous plants growing in the wild anywhere else in the world; they are only found within 60 to 75 miles of Wilmington. These can be hard to spot (each is just an inch or two in size) but in May their tall white flowers bloom, making them easy to see along the forest floor. When not in bloom look for the flytraps – that look like clam shells with teeth – along the sunny paths of the park’s Flytrap Trail. The Stanley Rehder Carnivorous Plant Garden in Wilmington is another stop for Venus flytraps. Stanley Rehder spent his life cultivating carnivorous plants. When he died the city dedicated his outdoor lab as a park. An observation deck overlooks thousands of flytraps and pitcher plants within the three-quarters of an acre garden. You can venture into the garden via stepping-stones for up close views. Take note: The 2013 theft of more than 1,000 flytraps from this garden prompted the North Carolina legislature to pass a law making removal of Venus flytraps in the state a felony crime. It’s easy to see why Airlie Gardens is the jewel of Wilmington’s gardens. Started in 1901, today it is 67 acres of pure botanical bliss. Massive moss draped trees, including the Airlie Oak – North Carolina’s champion live oak dating to 1545 – line the paths leading to over a dozen themed gardens. A few of these include the Pergola Garden adjacent to Airlie Lake with a circa-1900 pergola of native tabby, a mixture of lime, water, sand and Wrightsville Sound shells. The Tranquility Garden has several showcase gardens filled with seasonal plantings plus the butterfly house. The Bottle Chapel is made of over 2,800 empty bottles in a mosaic design. Airlie Gardens is known for its springtime blooms with over 100,000 azaleas and countless camellia cultivars on display. The New Hanover County Arboretum was my biggest garden surprise. It’s much larger (7 acres) than most North Carolina Cooperative Extension gardens. 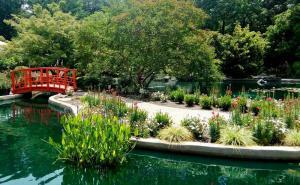 Over a dozen different sections feature rose, aquatic, Japanese, herb, butterfly, children’s, and vegetable gardens, plus several greenhouses, a koi pond and an ability garden with raised beds. Bring a lunch as picnics are welcomed. Okay, so you don’t think “garden” when you visit a cemetery. And you might find it creepy. But if you look beyond the graves, you’ll discover cemeteries are filled with flora and fauna. Oakdale Cemetery, started in 1852, is 100 acres of Darlington oaks and landscaped burial plots. Post Civil War cemeteries became respites where families would spend the day with deceased relatives. They wanted nice surroundings, so they added garden beds to the graves, along with benches and settees. Some added favorite plants from far away places, which is why there is a mountain laurel in Oakdale. Early grave markers gave a nod to gardening, and one unique style here is the treestone. Each tree-looking stone is carved with ornate symbols of ivy, flowers and wildlife to tell a story about the deceased. 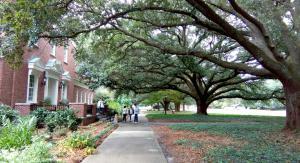 The campus of UNC-Wilmington is an arboretum with many gardens to visit. The Bluethenthal Wildflower Preserve, tucked into the dense woods near the student union, offers level paths through towering pines, small ponds, and a forest floor filled with wildflowers. The Heritage Garden near the quad has stately live oaks that stand like sentinels on either side of the great lawn, and garden beds filled with plants to create an old-fashioned Southern garden. 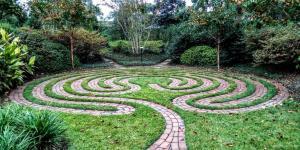 Don’t let the location of the Heritage Garden at the Lower Cape Fear Hospice keep you from visiting. After all, gardening is a healing activity. Meandering paths connected by a series of charming footbridges over bubbling water features lead to various themed garden rooms. Of special note is a labyrinth created in the shape of a tree. Other Wilmington garden stops include a 5-mile drive around Greenfield Lake, especially in spring when the azaleas that ring the lake are in bloom. The Harbor Island Garden Club maintains a garden in Wrightsville Beach Park. While small at one acre, it includes a rose garden and a Plant It Pink garden that honors breast cancer survivors. The Cape Fear Museum has an outdoor park with native and adaptive plants, as well as indoor interactive exhibits that tell the story of the region’s natural resources, including its fauna. Several historic gardens are located in Wilmington’s historic River District. The Burgwin-Wright House & Gardens has seven separate garden areas, including an orchard with figs and pomegranates, a crabapple espalier, and a parterre with trimmed boxwood. The 1852 Latimer House Museum is surrounded by a restored Victorian garden. Large 150-year old magnolia trees anchor the landscape of the Bellamy Mansion Museum of History & Design, an antebellum home built between 1859 and 1861. Throughout the historic district are charming homes with lovely gardens that beckon you to look over their garden gates. Flytrap Family Fun Day (March 31, 2018) is a day filled with flytrap-theme games, crafts, hikes, speakers more at Carolina Beach State Park. North Carolina Azalea Festival (April 11-15, 2018) celebrates spring Southern-style with music, art, food, a street fair, azalea queen, and a parade. For a complete schedule of events, visit the festival website at ncazaleafestival.org. Cape Fear Garden Club’s Azalea Garden Tour (April 13-15, 2018) is held during the N.C. Azalea Festival and features a dozen gardens ablaze in azalea blooms. Poplar Grove Herb & Garden Fair (April 7-8, 2018) hosts its annual family-friendly plant sale with special programs at Poplar Grove Plantation. Lakefest (April 14, 2018) is a celebration of the history, plants, animals, and water of Greenfield Lake with special activities, animals and guided eco-tours. Master Gardener Annual Plant Sale (April 19-22, 2018) at the Arboretum of New Hanover County provides an opportunity to engage with master gardeners and purchase local plants. Flytrap Frolic (April 21, 2018) celebrates Venus flytrap and other carnivorous plants that grow at the Stanley Rehder Carnivorous Plant Garden in Wilmington. 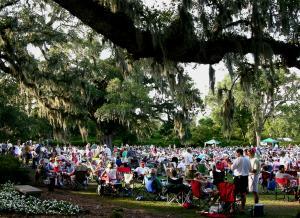 Airlie Gardens offers a summer concert series (May 18-September 21, 2018) the first and third Friday evenings from May through September. This year’s summer art exhibit theme is Gnome Invasion (July-October, 2018). Look for 15 oversized 5-foot-tall fiberglass gnomes placed throughout the gardens. Art in the Arboretum (first weekend in October) is the fall fundraiser for the New Hanover County Arboretum. The gardens are filled with music and art vendors showcasing everything from prints and pottery to sculpture. Enchanted Airlie (select weekends, late November through mid-December) is a holiday extravaganza featuring over 1 million lights throughout Airlie Gardens, Santa and entertainment. Advance tickets required. Tidewater Camellia Club Show & Sale (last Saturday in February) is an American Camellia Society juried show featuring over 500 blooms at the New Hanover County Arboretum. 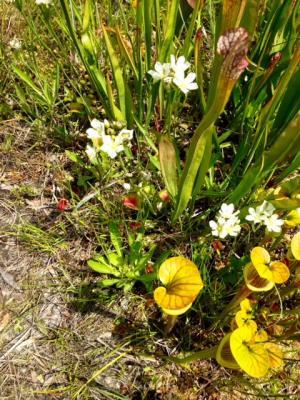 Carolina Beach State Park leads guided carnivorous plant hikes on Saturdays and Sundays spring through fall. Oakdale Cemetery offers guided garden tours spring through fall. Beverly Hurley is the editor of Triangle Gardener magazine in Raleigh, North Carolina and the editor of GardenDestinations.com. When she is not gardening, she loves to travel.